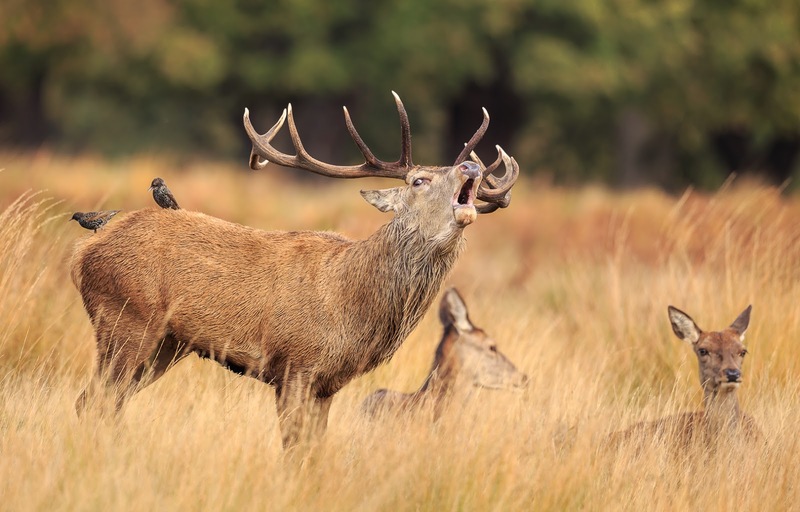 Back in mid-October I visited Richmond Park with a few friends with the aim of photographing the red deer rut. We arrived sharp at 7am to coincide with gate opening and within a few minutes we saw a number of stags near the side of the road, before parking up in one of the designated car parks. The light levels were very low, which gave us time for a coffee before we headed off into the park. Quite by chance, we appeared to be in quite a good location, with a number of groups of hinds being guarded by stags (or harts as they are also known). There was little activity early on, with most animals sitting down, which gave us some opportunities for group shots and to familiarise ourselves with their behaviour. After a while, and as the light improved, I became aware of some activity about 500 metres away in one of the open areas. 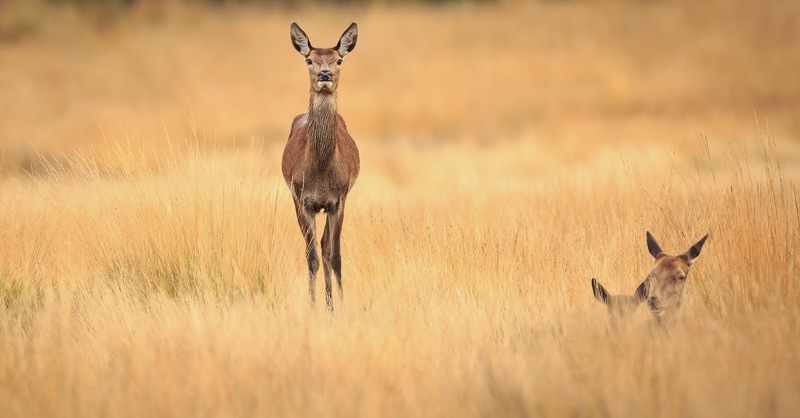 There was a small group of hinds and a couple of stags in close proximity so we headed off in their direction. 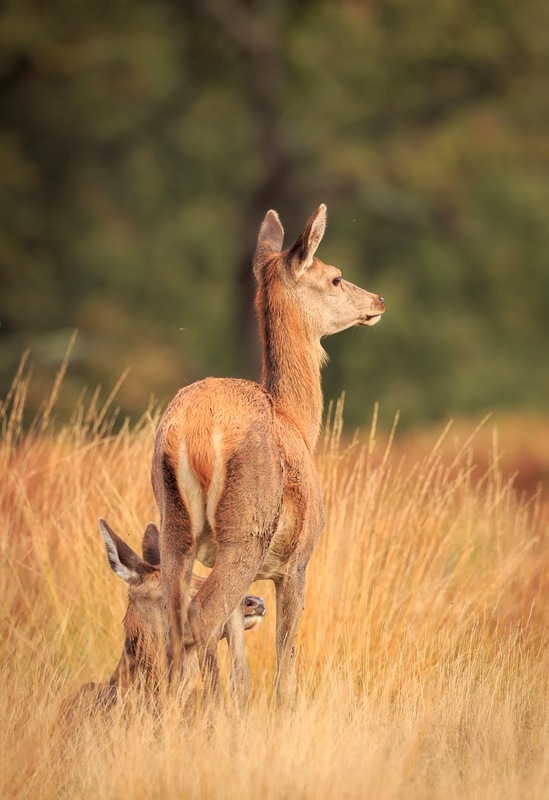 As we got within a few hundred yards I took some shots of them in the long, autumn-coloured grasses. At this point we spotted a couple of young stags posturing and starting to lock horns. It was not a violent interaction - just a couple of 'teenagers' sizing themselves up. By now the light had improved and there was more activity as other stags made their way into the area. 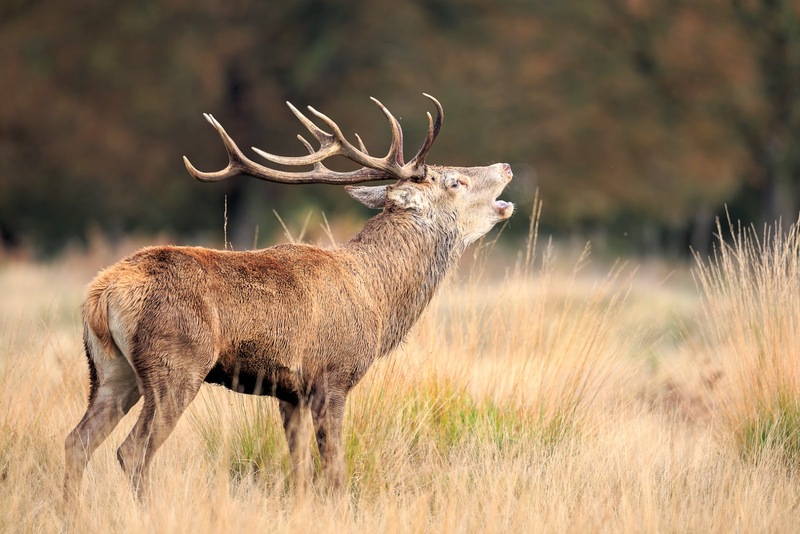 At one point a stag trotted over from the distant woodland but, when it got within 20 metres of one of the dominant males, it turned and ran away. 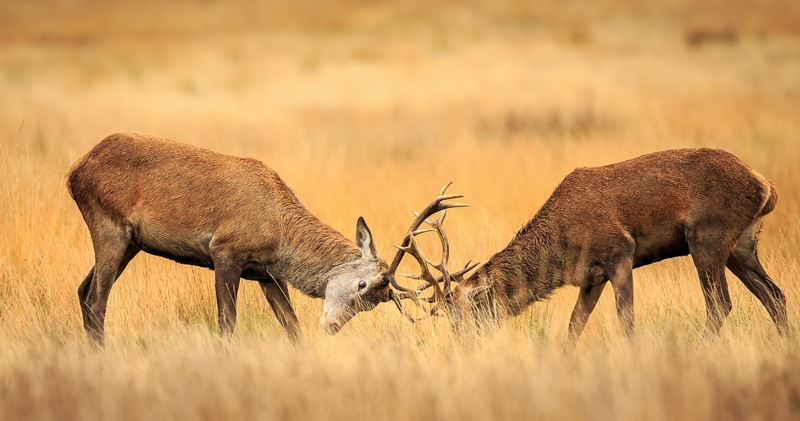 Despite a lack of real clashes between the stags, there were still lots of photo opportunities. We spent the next hour or so photographing a stag and a group of about eight hinds as be worked his way around them to ward off others. 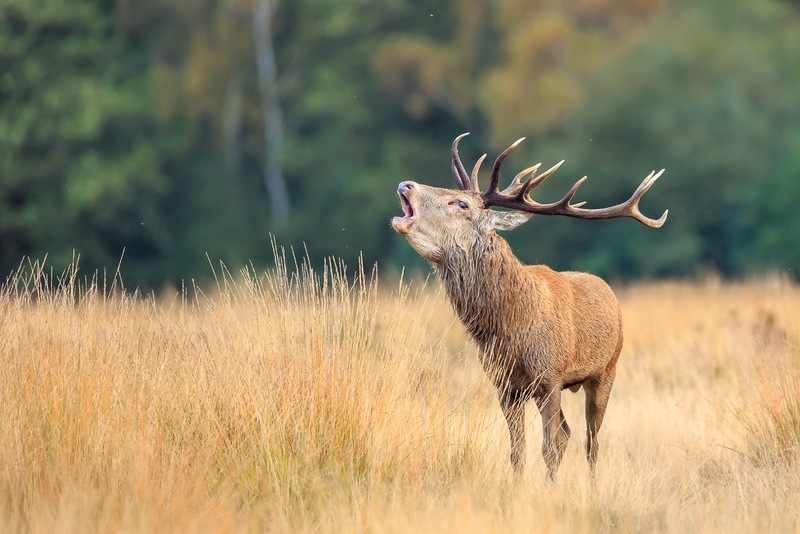 My two favourite shots of the day are of the hart bellowing against the autumn colours of the trees. 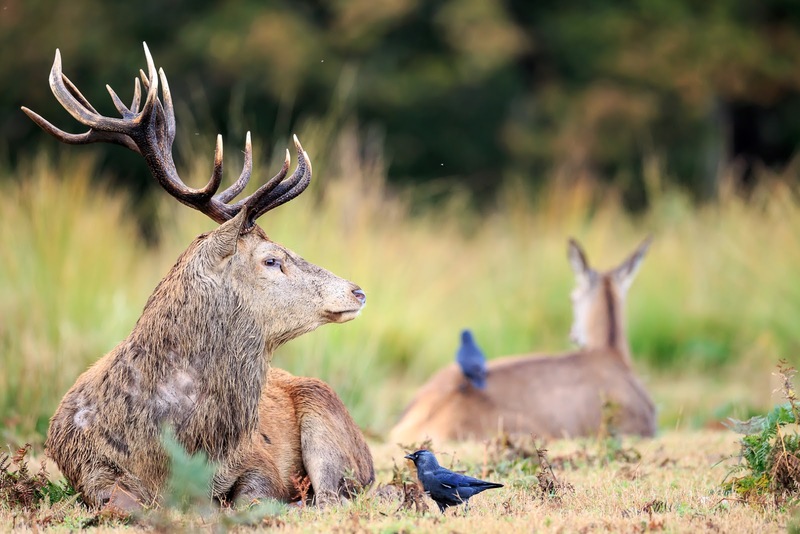 With the last one I was lucky enough to capture the moment when a pair of starlings decided to settle on the stag's back. All in all, a great couple of hours photography and something that I would like to repeat.